Those color fades in the wings are rockin' my world. Also that tail swoopy! The past few months I've been cutting John's hair, which I'm sure explains a lot to our local friends (WHAT I'M TRYING), and is also why I've been watching a lot of Youtube tutorials on cutting hair. Anyway, I'm liking this one: everything we need is right there in the garage! Plus I could really see myself venting some frustrations at the same time. What do you think, John? John? [looks around] John? Hey, where'd he go? Hope your week of getting back to work and real life is going well, gang, or at least smoother than mine. (Tomorrow, WE BRA. Maybe.) John's been out repairing some water damage across the street all week, so you know that old saying: "When the cat's away, the mouse does whatever the heck she wants, same as always, except she's hungrier now because no one's here to make lunch." Pretty sure that's how it goes, anyway. "that tail swoopy," Heck yeah it is! I love the purple gems, too! Hope you get back in the groove soon, Jen, post holidays are always rough. By the way, have you ever considered making a tumblr? I'd totally follow you if you did! This blog entry is surprisingly Germany-centric! 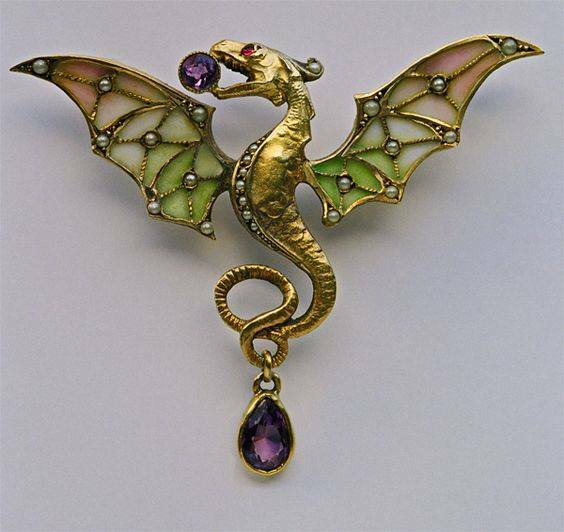 My husband is German, and my mother-in-law lives in Pforzheim, which is the town where that dragon brooch was originally made. Still a huge area for jewelry makers, although not in the Art Nouveau style, unfortunately! And I need to find that bridge during one of our jaunts to Deutschland, it is gorgeous. And I'm with you on the grumpiness, post-Christmas is the worst. Happy New Year! Oh! I also cut my son's and husband's hair, it definitely gets better with practice! I'm still not great, but at least I can give them a leeeeetle bit of style! No axes, though. XD I've been trying to avoid my boulder holder at all costs but its so cold! I started down the path of youtube videos when my husband needed a trim and primp for his beard and I was tired of it always coming out wrong for him. I now know far too much about beard care. There are more of your kind. My son got me a Mumford and Sons record for Christmas. For the haircutting video, I had to keep repeating "Jen would warn us if there was blood. Jen would warn us if there was blood." And I cried at the "without love it is just a meal" (Ohne Liebe ist es nur ein Fest). Ugh, I hate when commercials get me right in the feels. Thank you for translating that. Even without knowing the language, the commercial made me tear up a bit, but knowing that's what it says makes it even more sweet! Ditto what Laura said! Having the translation makes it so much better. I have never loved a blog post title so much. It's a serious contender for Title Of My Future Autobiography. I haven't put on a bra in ten years. Never felt better body-wise. This bridge is giving me life. How fantasy is that? Why didn't they shoot some scenes from LOTR there?! Wow, that Edeka commercial is fantastic. Great find, Jen!